The Russian-hybrid occupation of the parts of Donetsk and Luhansk oblasts which began in 2014 turned the territories into areas devoid of justice. Having taken control over the local information space, the occupiers attempt to create an illusion of statesmanship and normal life in the territories they control. But the reality contradicts the cheery propaganda pictures. The self-proclaimed authorities are the only law, and the residents have no legal protection from violence, beatings, rapes, kidnappings, and murders. The report “Executed in Donbas” by the NGO Myrnyi Bereh reveals the information on crimes committed in 2014-2015. However, it documents only a small of the atrocities: local dissidents are still illegally arrested and kept behind bars for just having a pro-Ukrainian position and no one knows how many people were killed in the occupied parts of the Donbas in 2016-2017. On 6 June, the NGO Myrnyi Bereh presented its report titled “Executed in Donbas” in Kyiv. Human rights activists, lawyers, and civil investigators collected information on 95 cases of intentional homicides and executions in the Donbas. “We investigate into each of those cases, the likely perpetrators are known for many of them,” the report reads. Deputy chairman of the NGO Kateryna Vizhevska, who is one of the authors of the report “Executed in Donbas,” said that the investigation continued for more than six months. Its task is to bring the perpetrators to justice. According to international law, the crimes included in the report are qualified as crimes against humanity and war crimes. The report provides the statistic information concerning 95 cases of murders in the Donbas, which are documented and investigated by the NGO Myrnyi Bereh. The cause of death. 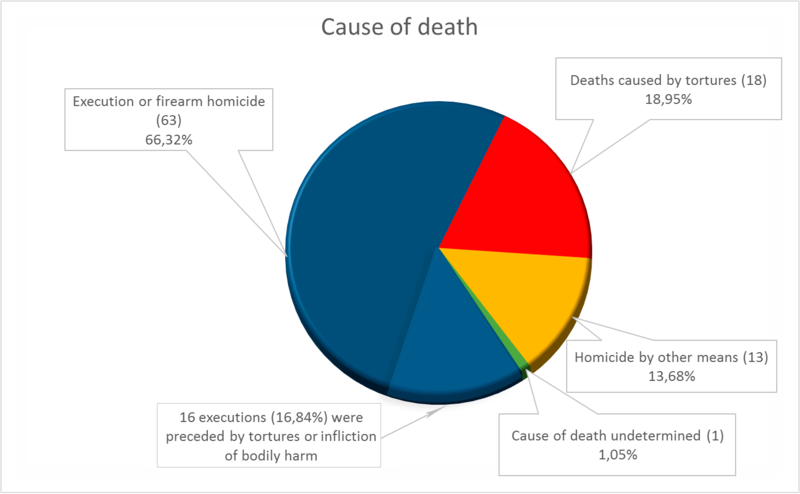 According to the investigation results, an execution or firearm murder caused the death in 63 cases, 16 of the executions were preceded by torture or violence. Tortures caused death in 18 cases. 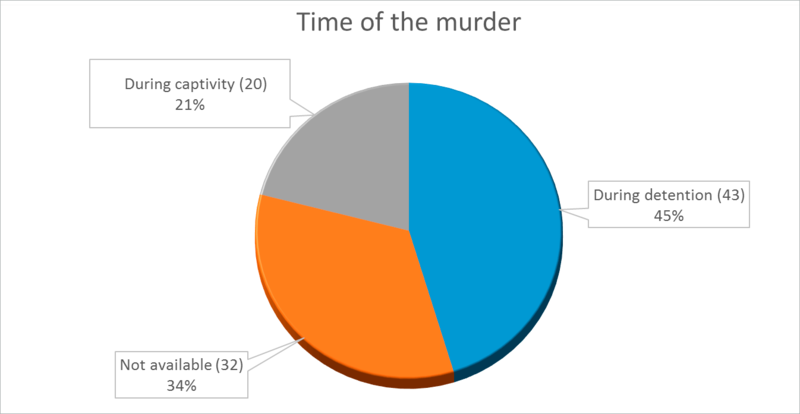 The time of the murder. According to the investigators, 43 death cases occurred during detention, 20 more when the victims were held in illegal captivity. Suspects by identity. According to the report “Executed in Donbas,” members of so-called DNR are suspected in 49 murders, members of so-called LNR are alleged perpetrators of 30 deaths. Unfortunately, the conditions of war have led to the territory of lawlessness spreading to government-controlled areas as well: the report states that Ukrainian servicemen committed 11 of the 95 murders. 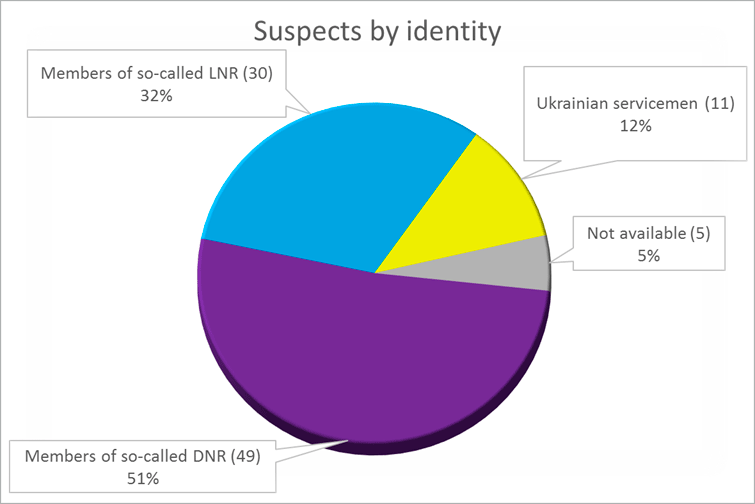 Ukrainian servicemen are also mentioned in the report as those who committed 11 of 95 documented murders. They served in the Tornado, Aidar, and other volunteer battalions. The report’s conclusion states that judicial proceedings against them continue in Ukraine. Gender of victims. As per the report, 84 victims were men, 11 – women. Military vs. civilians. 50 victims were civilians, 45 were from the military. The report reveals 9 cases of military crimes in the Donbas in 2014-2015 to illustrate what kind of crimes the NGO documents and investigates. Each case is described, victims and suspected culprits are named, legal assessment is provided. The report is published, what’s next? Head of the NGO Myrnyi Bereh, Hennadiy Shcherbak told Euromaidan Press that all the collected information is entered into a special database. The database includes information about the 10,000 victims of the war in the Donbas, both civilian and military. The victims are categorized as missing, killed and wounded persons, prisoners of war and so on. About 2,000 more of so-called militants are also put into the database. The cases of crimes being documented and investigated by the members of the NGO are also put into the database. Each person listed in the DB is linked to the cases he or she is involved in. The database will serve as an evidence base of the crimes and involvement of “DNR”, “LNR,” and Russia during the proceedings at the national level and the international court. The NGO Myrnyi Bereh is a member of the Coalition “Justice for Peace in Donbas,” an informal union of 17 human rights organizations and initiatives, combining efforts in documenting of human rights violations, committed during the armed confrontation in eastern Ukraine. Ukraine: It’s not just another war!